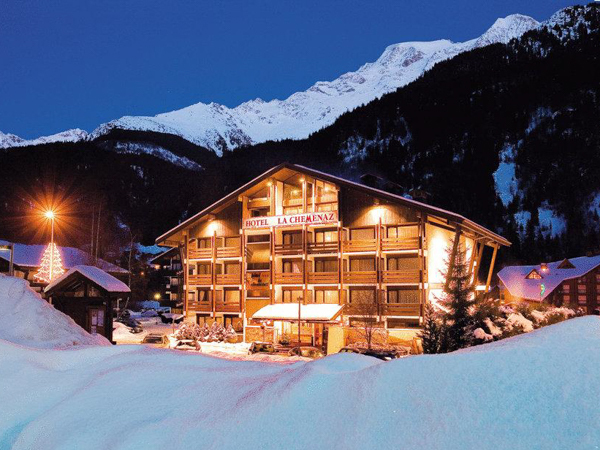 Hotel La Chemenaz is situated in a stunning location, facing the Mont Blanc mountain range, and just 50m walk to the ski lifts that take you to 120km of skiing in the Contamines-Hauteluce terrain. 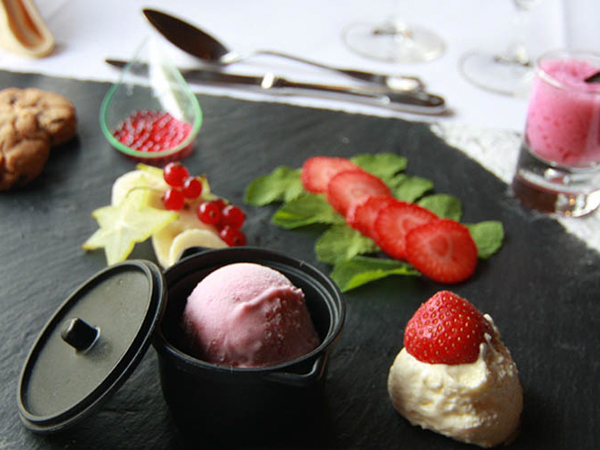 This family-run hotel is a ‘Member of Hotels-Chalets de Tradition’, which means they adhere to a high standard of comfort, quality, hospitality and a warm welcome. 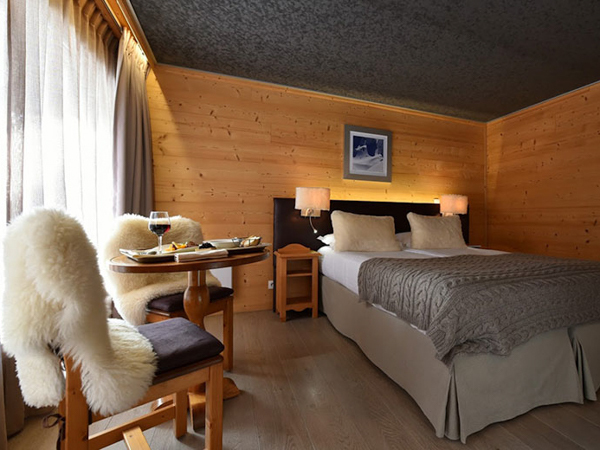 There is a heated ski and boot drying room, and they also have their own ski hire facilities on-site, so combined with its proximity to the lifts, this hotel gives you more time on the slopes. 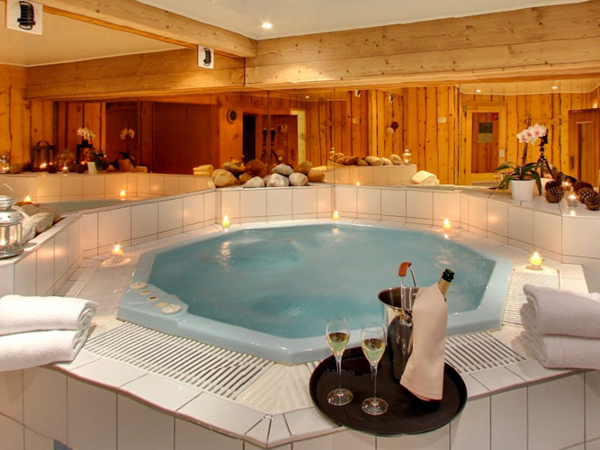 Then to ease those tired muscles after a long day, there is also a sauna and hot tub for guests’ use. When you’re done, just relax in front of the roaring fire in the refined lounge bar, and watch the skiers and snowy life pass by through the large panoramic windows. 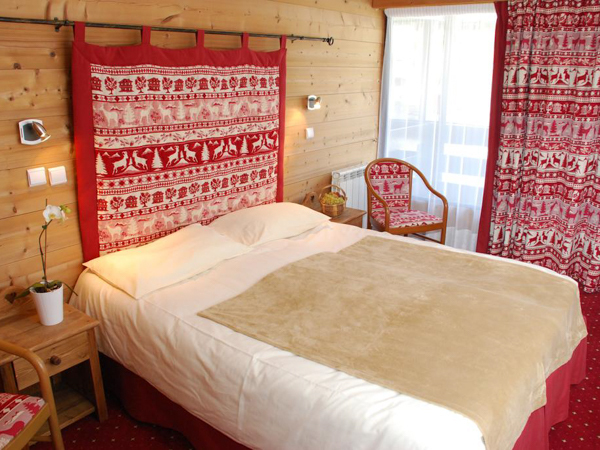 This attractive hotel has 40 soundproofed rooms, each with ensuite facilities, and they are decorated with warm, natural wood furnishings, in a tasteful Savoyard style. They also come with satellite TV, a telephone, hair dryer, safety deposit box and free WiFi access. Accommodation comes in double, triple or family rooms – the latter including a double and either a single or bunk beds. Each of the rooms has a large bay window and a balcony, many with excellent views of the surrounding mountains. 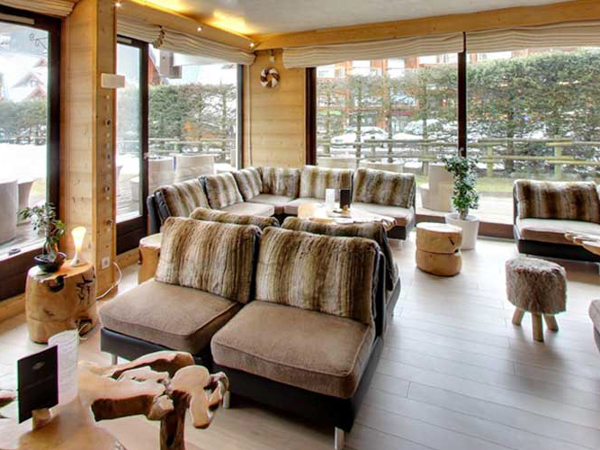 The hotel has a very comfortable lounge bar area, with an open fire, a games area with table tennis, table football, board games and a library, so lots of fun to be had off the slopes, as well as on. 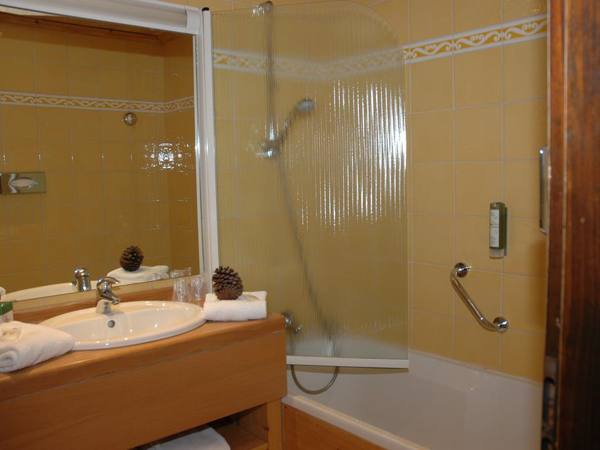 In addition, there is a spa area containing a sauna and jacuzzi if you feel like something a little more relaxing. 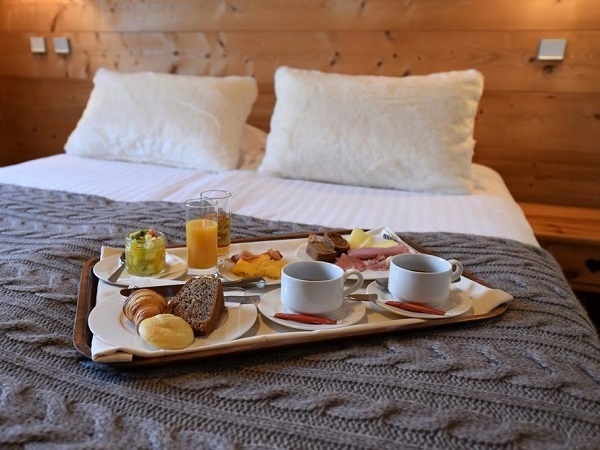 The hotel is also only a 15-minute walk from the centre of Les Contamines, and just 150m from the Nordic Park, where you can try biathlon, climb an ice-fall, or enjoy a dog-led or horse-drawn carriage should you wish. 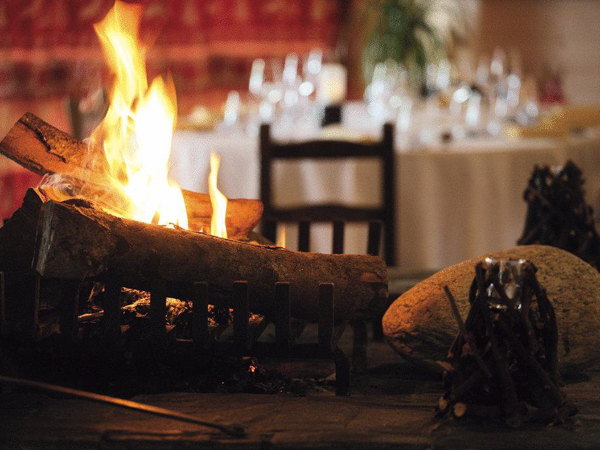 La Trabla restaurant is where the hotel’s renowned food is served, and is set around a large central fireplace. 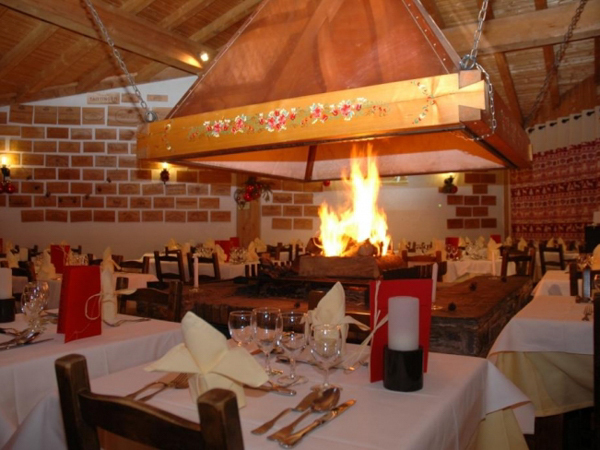 Here they serve a range of local and traditional dishes, including the popular ‘raclette’, a favourite in the Savoie region, as well as fondue and tartiflette. Catering is on a half-board basis, with a continental breakfast buffet, and tasty 3-course evening meal. 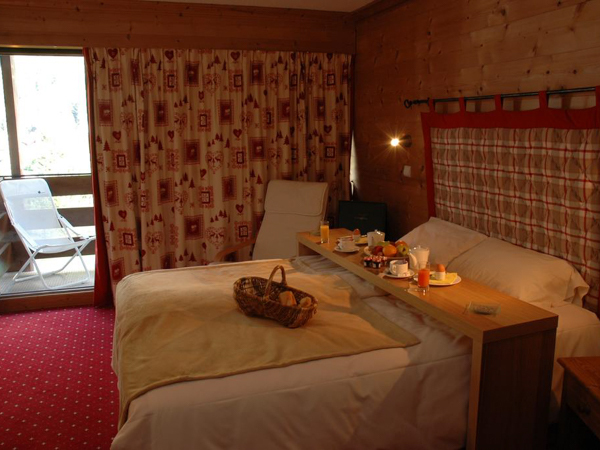 The hotel is just 1 hour 10 minutes from Geneva airport, and is located a 15 minute walk from the centre of Les Contamines, yet is only 50m from the ski lifts, that give access to the 120km of pistes in the Contamines-Hauteluce ski domain. There is a free shuttle bus to the village too, if your legs have had enough exercise for one day. In addition to skiing and snow boarding, here you can also try Nordic skiing, hiking with skis or snowshoes, dog sledding, biathlon, ice-fall climbing and much more. In terms of après-ski, the village is pretty low-key, with a few bars and restaurants, in fitting with the laid back vibe of this resort. It really is more about the skiing, the great snow conditions and the fantastic scenery. A Les Contamines-Hauteluce region ski pass is included in your package and will be ready for you on your arrival. With our ‘Lite Packages’, you benefit from our experience and support in arranging all the elements of your holidays within an inclusive package – yet with more independence and flexibility as to how you eventually enjoy your holiday. All of our ‘Lite Packages’ include your accommodation, airport transfers and full region lift pass – but unlike on the ‘Classic Packages’, you won’t see one of our team every day and we do not have our Ski Team on site to actively manage your days – leaving you to ski and enjoy your holiday independently. However, we will still be available and easily accessible to support and help you should you require it! Access to our off-site ski team if required. *Airport transfers on Lite Packages are included for flights scheduled to arrive into Geneva between 1500 to 2115, and for departure flights taking off at 1600 or later. On departure, your airport transfer will leave resort 3 – 3.5 hours before your flight time, meaning an evening flight from about 2000 onwards will let you ski all day on your last day. Stays at Hotel La Chemenaz are possible all through the winter season, from mid-December to mid-April. Prices are per adult, assuming 2 people sharing a twin / double room. Availability can change suddenly at any time and may depend on your group size, so please contact us >>> for the most up to date information. 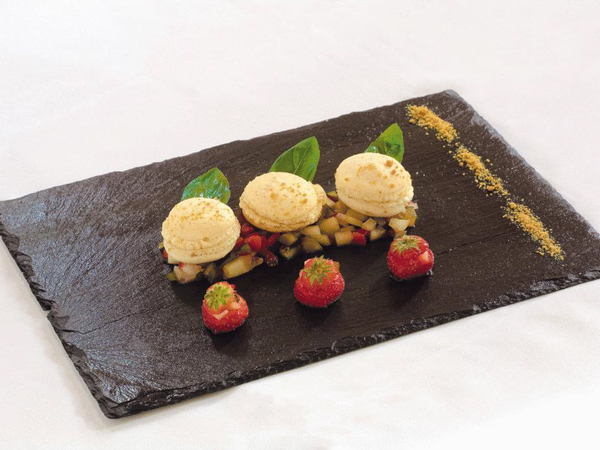 Stays include half-board accommodation – continental breakfast and 3-course evening meal. All stays at Hotel La Chemenaz include a full Contamines-Hauteluce region lift pass, covering 120km of skiing. Airport transfers are included on standard break start / end dates, for flights scheduled to arrive into Geneva airport between 1500-2115, and depart 1600 or later. 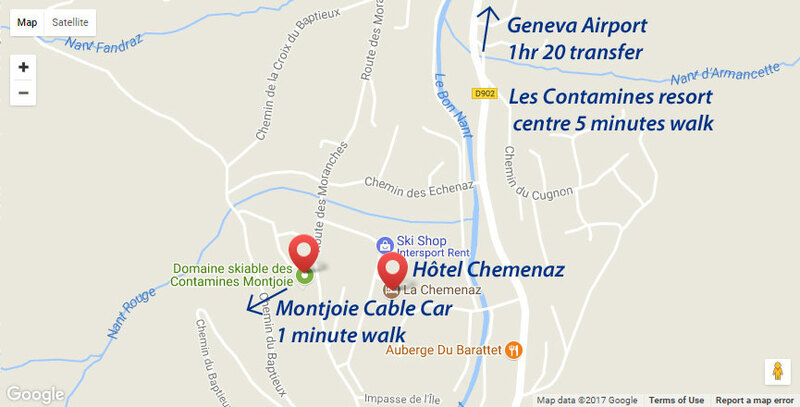 Transfer time from Geneva to Les Contamines is just 1 hour 10 minutes. Our partner ski hire shop in Les Contamines is based in the hotel basement – so provide you with the most convenient ski rental options by far. Simply pop downstairs for great equipment and friendly service. We can recommend ski schools in Les Contamines who provide good English-speaking ski instructors, for private lessons. New to Skiing or Snowboarding? Don’t have all the gear you need for your ski holiday? No problem, we have a solution! Whether you simply need a jacket or trousers, or you require the full works, we can offer you a range of high quality ski clothing (via our partner Crevasse Clothing) during your holiday with us. You will need to order this in advance, but once done, it will be ready and waiting for you when you arrive at your accommodation. Ski Weekender guests staying in Les Contamines can pre-book their clothing package on our Ski Clothing Hire partner’s website. Your clothing will then be sent through the post and it will be ready for you when you check in. Word-of-mouth recommendations are important to us. Click on the TripAdvisor logo to see the many reviews from guests who’ve stayed at Hotel La Chemenaz. Want to stay at Hotel La Chemenaz... ?